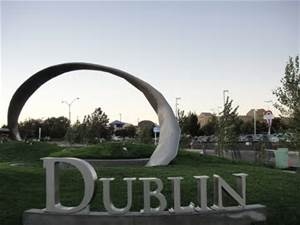 Dublin, CA is town of just under 50,000 residents that likes to pride itself on being situated at the crossroads of the SF Bay area, and, in a way, it is. Located at the intersection of busy 580 and 680 in Alameda County, it is just north of Pleasanton, and south of San Ramon. This whole Tri-Valley complex of cities going out 580, and up 680 has become an outstanding source of business, technical and economic growth for the last 10 years. 235 Properties Found. Page 1 of 7. Shari Welters Toll Brothers Real Estate,Inc. Sherri Stoneberger Legacy Real Estate & Assoc. Helen Eldredge Toll Brothers Real Estate,Inc. While Dublin is known for many things, it is hard to ignore the popular and varied sources of shopping in the area. In conjunction with Pleasanton's nearby Stoneridge Shopping Center, Dublin presents some of the best shopping opportunities in the area. It is hard to miss the commanding architecture adjacent to the freeway that is represented by the Hacienda Crossings Shopping Center, with the 21 screen and Imax movie theater, Best Buy, Barnes and Noble, Bed, Bath and Beyond, and an outstanding collection of restaurants to please the many visitors to the center. Coupled with the Dublin Retail Center housing Ross, Marshalls, Orchard Supply, and Dublin Place just across the street offering Target, Toys R Us, Hobby Lobby, and more, one could say that Dublin could correctly be called the retail crossroads of the area. Named after the city in Ireland, Dublin has a strong commitment to its residents. Its active Parks and Community Services Department offer daily programs designed to appeal to residents who range from childhood through the senior years. It has an annual St. Patrick's Day celebration complete with bagpipes, a 5k Run and Walk, a festival and a parade. Other annual events include Spring Eggstrasvaganza in April, which includes a "freestyle egg hunt", carnival games and arts and crafts. One of the more popular events is the Family Camp out. Families bring all they need to a park to stay overnight, and then settle in to have entertainment, arts and crafts, group games and "s'mores".